Some restaurants are so exclusive they are only open to their neighbors. At New York’s 432 Park Avenue, which will be city’s tallest residential building when its completed in 2015, developers are creating an 8,500-square-foot private restaurant that will serve three meals a day exclusively to the condo’s owners and their guests. 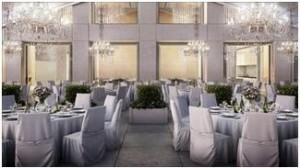 There will also be a semiprivate dining area and an adjacent 5,500-square-foot tented terrace. The 104-unit building’s condos range in price from $7 million to $95 million. In Key Biscayne, Fla., Oceana Key Biscayne is constructing a private restaurant with globally-inspired cuisine that’s dedicated to the buyers of its units priced from $2 million to $19 million. Another going up within the Grove at Grand Bay in Coconut Grove, Fla., will serve breakfast, lunch and four-course dinners seven days a week. “There’s a lot of product on the market in Miami now, and this stood out,” says Frank Hessel, who with his wife Jodi recently purchased a 4,200-square-foot condo at the Grove at Grand Bay. 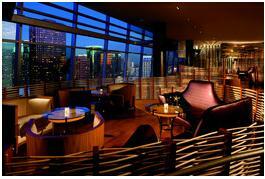 Public restaurants in luxury buildings are far more common. Owners at the Ritz-Carlton Residences at L.A. Live have preferred reservations and semiprivate access to its Wolfgang Puck restaurant, WP24. But supporters of private dining argue that public restaurants are too, well, public. Residents “have problems getting your car to the drop-off, increased valet wait time and security issues, says David Martin, president of Terra Group, the developer of Grove at Grand Bay. Noel Berk, a resident, says she held a cocktail reception for her wedding in the restaurant. A couple of nights a week she either dines there or orders room service. “It’s extremely convenient when you come home tired and exhausted and haven’t had time to shop,” she says. At 825 Fifth Avenue, built in 1927, a private restaurant with formal dining room is still operating. Apartment prices there have topped $12 million. Kathryn Steinberg, a 20-year resident of One East 66th Street on Manhattan’s Upper East Side, says her building has a French chef who prepares room service dishes like lamb stew and crème brûlée. “I come home, look at the menu and decide what I want to eat tonight,” she says. Developers of the Ritz-Carlton Residences, Singer Island in Palm Beach, Fla., wanted the building to keep its hotel-like vibe while maintaining the exclusivity of a private building. The restaurant there has a seasonally-changing menu. “It’s almost like having a private chef,” says Ophir Sternberg of Lionheart Capital, developer of the property. Developers and residents of such buildings say private restaurants rarely make enough money to cover their expenses. Managers of private restaurants say their operations can cost $1,000 a day, or more, just to staff. So in addition to their usual monthly charges to maintain the building and cover staffing, residents typically also pay fees to keep the restaurant going, plus a minimum dining charge. A three-bedroom apartment listed at 825 Fifth Avenue for $7.5 million notes a $732 monthly “catering charge” and a $2,000 annual restaurant minimum. Residents of 432 Park will pay $3,500 annually for the restaurant, which goes toward their dining minimum. Then there are the general headaches that come with opening—and running—a restaurant. “The restaurant business is not as tough as the development business,” says Arthur Zeckendorf, who developed 15 Central Park West with his brother William. “But it’s up there.” He says the decision to create the restaurant was “hotly debated,” since it would require dedicating amenity space to a back-of-house area for prep and finding a chef who could meet residents’ standards. Another challenge: the limited clientele means the flow of business can be hard to predict. At 432 Park, developer Harry Macklowe estimates that only about half the building’s apartments will be occupied full-time. So he worked with restaurant designers at Bentel & Bentel to come up with a grand space that would feel bustling even with only one or two tables filled. Thirty-foot high ceilings will be decorated with 15-foot-tall crystal chandeliers. Chefs will prepare food in an open kitchen to “create a little theater,” says designer Paul Bentel. Servers and staff will also help fill out the space. Thomas McLoone, the general manager of Club Metropolitan at the Metropolitan Tower in midtown Manhattan, says a private restaurant has different rhythms than a public one. “I don’t know what the busy day is going to be,” he says. Plus, “everybody’s a regular,” so turning people away is a no-no. A computer notes residents’ dietary restrictions and preferences. “We really work for them,” he says.